In order to be the best at his job, Jack leads a solitary life that consists of traveling the world, using various aliases and not getting to attached to anyone. After years of bending to the will of his superior Jack decides he is done with the business of killing. He takes one last job building a weapon for a fellow assassin in the hills of Italy, but Jack's descent into paranoia has already begun. "The American" reflects its main character almost too well. The film is cold, uncompromising and emotionally vacant. And this is a good thing. Anton Corbijn shot the film in such a way that one feels completely alone even in a packed out theater. After the credits began rolling, I felt a cold chill and immediately wanted to see people and interact to feel normal again. This is not an easy film, but if you are willing to devote the time to the slow burn pacing the last fifteen minutes carries a hugely intense payoff. The tension is nerve-wrackingly high the entire film and instead of having long stretches of dialog punctuated by intense situations, "The American" has one long strand of tension stretched across its entire runtime that is not snapped until its final moments. 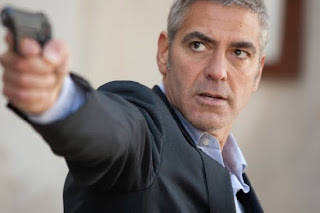 Much of what makes "The American" work so well comes out of Clooney's understated, contemplative performance. Many will call his work bland, but I believe the exact opposite is going on here. Outwardly, Jack shows zero emotion, but just behind his eyes there is a confused and lonely man that just wants to be loved. As his only "friend" and confidant suggests, he lives in hell. And hell is "a place with no love." There is not a lot that is to be said about this film as it takes place on an almost microscopic scale, but it takes that and uses it to its advantage, leaving most of it up to your own interpretation. "The American" makes you work to find the "point" of it all and is ultimately, extremely cynical, but the performance by Clooney leaves you searching your own life to see if you are really doing what you are supposed to be doing. And, let's face it, sometimes a re-assessment of our circumstances is a good thing.